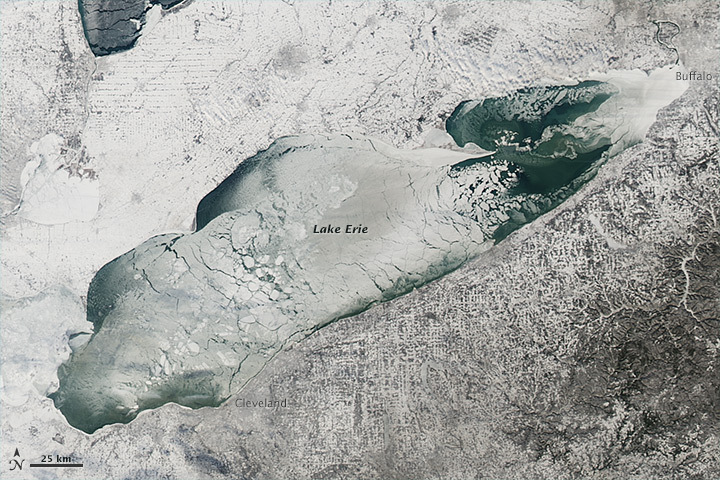 Almost every winter portions of the Great Lakes freeze up for the winter. This winter the Northeast already has two episodes of a ‘polar vortex’ under its belt, and a large percentage of the Great Lakes are frozen tight. Surveys earlier this month have reported 88% ice cover on January 12 and 62% on January 14 by the NOAA Great Lakes Environmental Research Lab. The second sustained cold front currently happening has led to more widespread ice formation throughout the lakes; some of the thickest in decades. Check out this animated gif showing ice formation across the Northeast during the past few days. Left without a winter home, the many hundreds of thousands of waterfowl, grebes, loons, gulls, and other waterbirds depending on these large bodies of water have very little choice but to move south towards the coast, and hope for some open water along the way. I’d bet the added pressure of the hordes of bloodthirsty Snowy Owls currently monitoring the last bits of open water on the lakes isn’t helping keep waterbirds there either. So, now, during the most recent and rapid cold snap, many birds are venturing southeast off Lake Erie and other lakes in search of open water. With the sustained cold temperatures, nightly snow, sleet, freezing rain, and lack of any sizable open water in most of Pennsylvania and other Northeastern states, the birds are in for a dangerous trip. Horned and Red-necked Grebes, migrating alone through the storms endured harsh weather conditions and there were widespread reports of both species found by birders south of their usual wintering areas during the past two weeks. 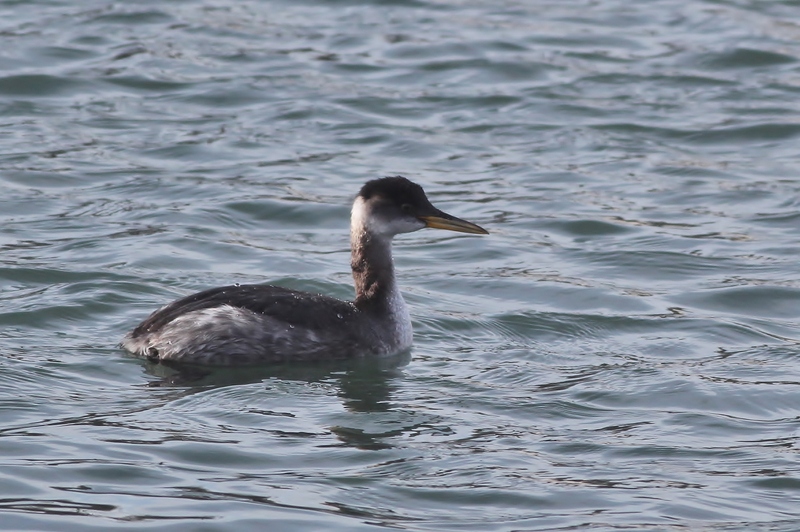 Alex previously wrote about a Red-necked Grebe he found in central PA, only the second January record for that species in the region. During the night when the grebes are migrating, freezing rain can accumulate on their wings, bodies, and faces just like an iced-up airplane. Previous accounts suggest that grebes can actually accumulate ice on their bodies while in flight. The added weight forces the birds to the ground. Desperate for open water, the grebes may end up wrecked on areas that look like water – frozen ground, parking lots, frozen lakes, pastures, roads, and other flat, open areas. 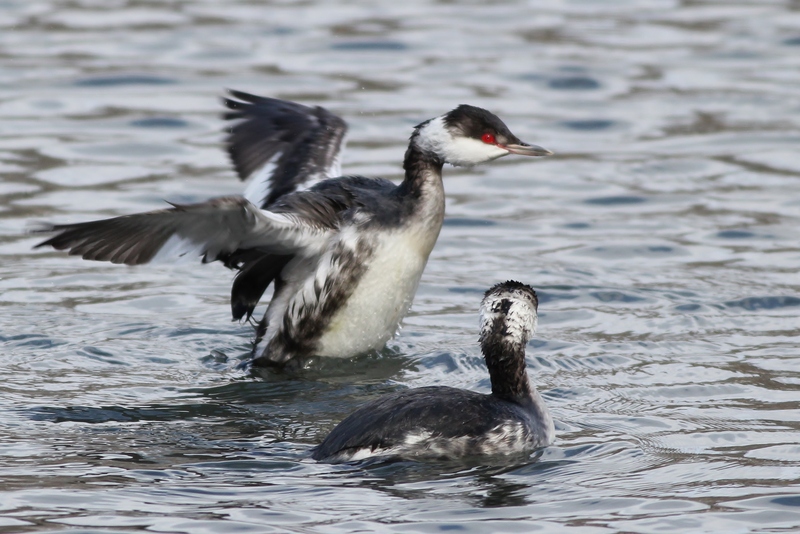 With their legs positioned far back on their bodies, grebes are unable to take off from land but are very well-equipped for diving and swimming underwater. This trade-off causes problems when the birds end up crashing into hard land, leaving them stranded. Without their legs able to cushion the impact, the grebes basically crash breast-first into the ground. This can cause serious injuries such as a broken bill, fractured skull, and crushed chests. Others that manage to crash into clumps of snow are less likely to injure themselves. 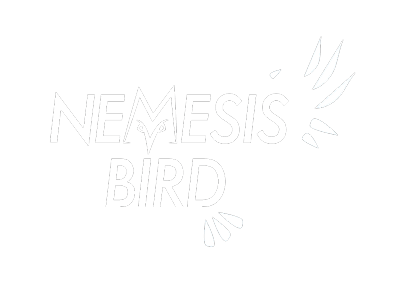 In either case the birds are not able to take off from the ground and usually freeze or are taken by predators. Grebe “wrecks” like this happen have been known to occur when a large portion of the Great Lakes freeze over. The extreme conditions that we are experiencing this winter have already created multiple wrecks across the Northeast, and more may be on their way. The winters of 1940 and 1965 saw hundreds of grebes found stranded or dead on land after nights with freezing rain (Eaton, 1978 and Todd, 1940). As birders, I urge you to go out and check any unfrozen bodies of water around your area especially on days following snow and ice storms. Collecting data on the numbers and types of waterbirds found during this time of the year can really help capture what effect cold weather has on wintering patterns related to climate. Red-necked Grebes are also fairly uncommon across inland areas of the Northeast, so this is a great opportunity to possibly find an unusual bird at your local patch! 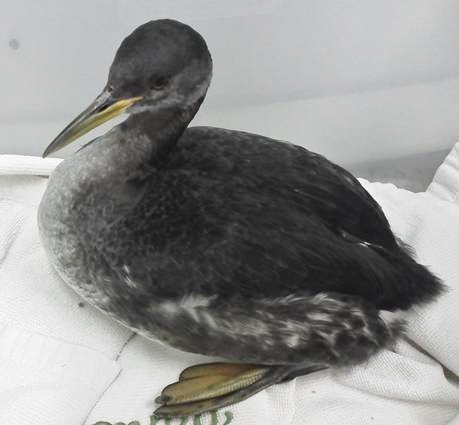 If you happen to come across a stranded or injured grebe or other waterbird, or if you hear that someone has found a “small loon”, contact your local wildlife rehab center or game warden. Many times, the birds are not injured and just need to be released onto open water where they can rest, eat, and then take off to continue to where ever they would like to spend the rest of the winter. Grebes and loons are not hard to capture; just throw a blanket, towel, or jacket over them and carefully place them into a cardboard box for transportation. 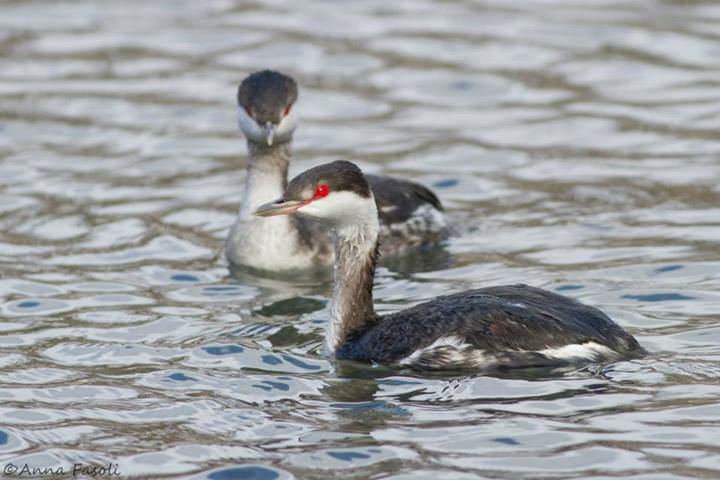 The grebe invasion into PA, NY, MD, NJ, DE and surrounding states has continued and sightings keep popping up every day. Today I found another Red-necked Grebe in Centre County, floating on the Bald Eagle Creek with goldeneyes and buffleheads! 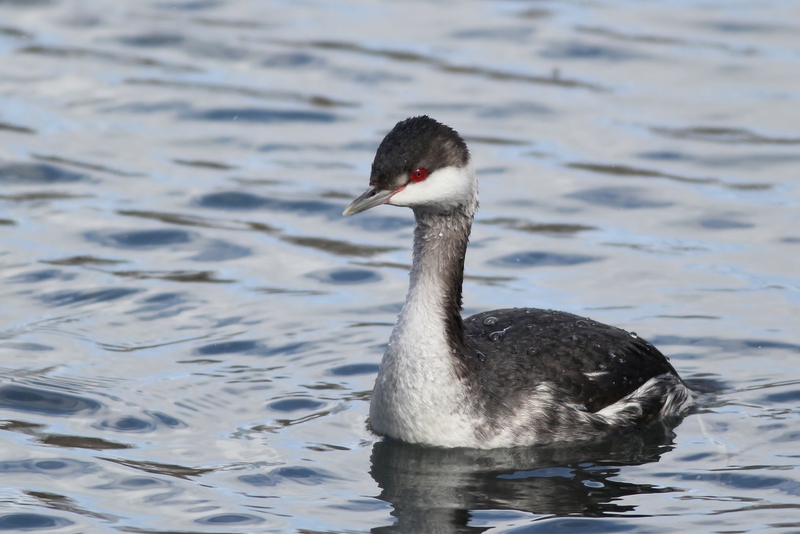 Check out this great article by Cornell’s BirdCast Team about the recent influx of Red-necked Grebe and White-winged Scoter sightings across the northeast due to the Great Lakes freeze-up.